Some wondered if they should leave their country. 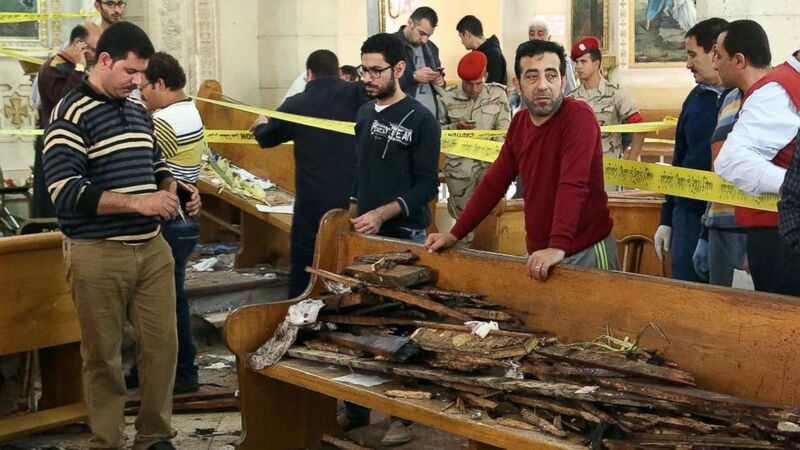 Egyptian Christians expressed anguish and despair following twin bombings that ripped through two of the country's Coptic churches on Palm Sunday, killing at least 44 people and injured at least 126 others. Chantal Labib, a 24-year-old school teacher, told ABC News that she saw news of the blasts on TV before she went to Palm Sunday services at another church in Heliopolis, Cairo. "Coptic churches are very distinct," Labib said of the often-ancient buildings that have long drawn many tourists in Egypt. From now on, she said, "the shape of the church and the pews [will] remind me of blood and dead bodies." The bombings in Tanta and Alexandria were claimed by ISIS and followed warnings by the extremist group that it would be stepping up attacks against Egypt's Christians. (AFP/Getty Images) A general view shows forensics collecting evidence at the site of a bomb blast which struck worshippers gathering to celebrate Palm Sunday at the Mar Girgis Coptic Church in the Nile Delta City of Tanta, 75 miles north of Cairo, April 9, 2017. The first blast occurred in the Mar Girgis Coptic Church in Tanta, and the second several hours later in Saint Mark's Cathedral in the coastal city of Alexandria. The bombings followed a similar recent blast in Cairo's largest Coptic cathedral in December that killed at least 25 and wounded dozens more, many of them women and children. All three of the explosions produced gory imagery that was circulated heavily on social media, with some showing mutilated bodies scattered among shards of shattered church pews. Egypt's Christian minority makes up roughly 10 percent of the country's population, according to a recent estimate by the CIA. Many of them are Coptic Christians, a centuries-old sect, while others are Catholic or Anglican. Labib told ABC News that she is wrestling with whether to leave Egypt. 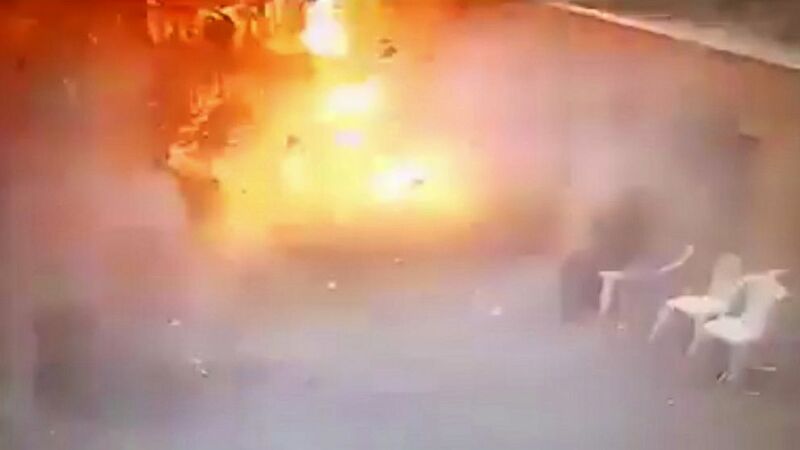 (Egyptian Interior Ministry via AP) In video made available by Egyptian Interior Ministry, a man sits at right as a suicide bomber detonates at the front gates into St. Mark's Coptic Cathedral in Alexandria, Egypt, Sunday April 9, 2017. "I love my country and was always critical of those who wanted to leave," she said. "My father has been wanting for us to leave for so long and we had the opportunity to move to the U.S., and I was the reason we didn't go." "But now i think that we only live once. Why should I waste my life in a place where I can't even pray?" Nancy Emad 26, a case worker with an international nongovernmental organization who heard the news of the church bombings on her way to mass today in Cairo, told ABC News that she wrestles with whether to leave, but for different reasons. "With every attack I feel like I'm less of an Egyptian, but this is not what will make me leave the country," Emad said. "I can leave for better economic opportunities, but not because my safety or my spirituality is not guaranteed because I will pray whenever I want and wherever I want. No one gets to decide [that] for me." Egypt's Christians were largely supportive of the military overthrow of former President Mohammed Morsi and were vocally critical of his Sunni Musilim organization, the Muslim Brotherhood, with some concerned that their minority community may not be protected under Morsi's rule. Today, some mulled whether the current government of President Abdel Fattah el-Sisi is able to protect Christians. "I dont know if the state could have stopped this," Peter Salib, 23, a student, told ABC News. "Terrorism is unpredictable. For example, the suicide bombing in Alexandria happened on the street before he entered, how could they stop such things?" In the U.S., President Trump took to Twitter to condemn the attacks and voice confidence in el-Sisi, who has been criticized by human rights groups for curtailing civil and political liberties since he took power in 2014. "So sad to hear of the terrorist attack in Egypt. U.S. strongly condemns," Trump tweeted. "I have great confidence that President Al Sisi will handle situation properly." The blasts came at the start of the Christian Holy Week leading up to Easter, and just weeks before Pope Francis is due to visit Egypt. The U.S. Embassy in Cairo also condemned both attacks in separate statements. "The U.S. Embassy condemns the heinous, reprehensible terrorist attack against peaceful worshippers at Saint George’s Church in Tanta on one of the holiest days of the Christian year," the Embassy wrote of the Tanta attack. "Our thoughts and prayers go out to the victims of this horrific attack. We express our deepest condolences to the families and friends of the victims, and we wish the injured a speedy recovery. The United States stands firmly with the Egyptian government and people to defeat terrorism." "The United States stands firmly with the Egyptian government and people to defeat terrorism," both statements said.